While the tables and chairs shape the most basic underlying physical structure in an Early Childhood classroom, there is another aspect of the physical environment that can and does transform a good classroom into a superb one. 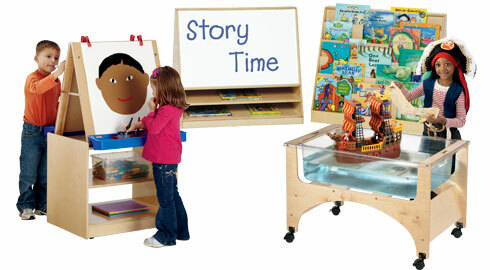 Learning Centers, areas in the room which have a rich variety of materials specific to that Center, invite exploration, problem solving and connections to real life. Having a Center based classroom helps me to organize the children’s learning, as I think about what I will be providing at each Center that will help the children learn what I am setting out to teach. We have already discussed the importance of furniture in your classroom; the pieces you choose for each early childhood learning center are equally important for the smooth functioning in your room. There are a myriad of types of Center equipment one can buy and truthfully, a lot depends on your taste, the atmosphere you want to emit and what your school mandates. There are seven Centers that can ensure that a classroom will be fun and enriching: Art, Manipulatives, Literacy/Writing. Library, Blocks, Science/Discovery and Dramatic Play Centers are basic to Early Childhood classrooms. Many classrooms now also have Technology and Music Centers. At the beginning of the year your Centers will probably have items that help the children show you who they are while also encouraging them to get to know one another. Although there are many ways to begin a new year, I am happy to share with you some tried and true materials and activities that I have at my Centers that have worked for me to start my year off in a successful way. In an Early Childhood classroom, the children take a great deal of pride in their artwork. They are very creative, with little inhibition when they work. For this reason, at the beginning of the year I give the children the opportunity to design many open-ended creations. I will give them materials with which they are familiar, such as markers, crayons and glue, but will watch carefully to make sure that I am not assuming knowledge that they do not have. Some children need direction while others will just go right to it and I like to provide materials that will cater to both. As an introductory art activity, I give the children a choice of the three basic shapes-triangle, square and circle cut from different colored paper. The children draw on it, use stickers or dot paints, or pick a medium of their choosing. I tape their creation onto a basket that each child gets in his/her cubby and it becomes their “signature” of sorts. They look for it when they come into school the next day, and since many of the children do not as yet recognize their names, they recognize their cubby by this very individualized piece of artwork. This stays on the basket for the entire year and goes home with the children in their Memory Book at the end of the year. I also have the children create their own lunch mats. I cut out all different types of foods from circulars and the children choose which they will glue onto their papers which are then laminated to become their lunch and snack mats. There is a great deal of conversation that takes place between me and the children, and by extension, between the children as well as they get to know one another through the universal language of food! You can really learn a lot about the children, their knowledge and their interests at this Center. It’s a good idea to encourage children who are having trouble separating from their parents or warming up to come to this Center as the materials there are conducive to both individual and group play. The solitary play almost always leads to more interactive communication once the children become comfortable and familiar with each other. It’s important to have small building toys, puzzles and other fine motor activities available at this your table toys center that speak to the different levels that you will encounter in your classroom. At the beginning of the year, for example, I will have both 6 piece as well as 25 piece puzzles for the children. I will have games for color identification but will also have an Alphabet puzzle for those children for whom it is appropriate. The board game Head, Shoulders Knees and Toes by Zwiggle is a wonderful beginning of the year game that combines getting to know one another with learning the rudiments of playing a game with simple rules. Children begin the school year with excitement, wonder and a bit of trepidation. If we set up our rooms with Preschool Learning Centers to allow each child to find his/her place in a safe, interesting and nurturing way, we can assure ourselves, the parents, and the children that each child will flourish under our care. In our next post, we will explore preschool writing centers, block centers, and other classroom centers which will help us achieve this goal.